Wenatchee, WA (September 17, 2018) Brittney Zamora is on the verge of making history … again. Zamora claimed the 2017 Northwest Super Late Model Series (NWSLMS) championship and became the first northwest touring female champion. Having one championship as a female is a big deal. Having two is history making. Zamora has only to take the green flag at the season championship 5th Annual Neal Newberry 125 event at Wenatchee Valley Super Oval (WVSO) this Saturday to clinch the 2018 championship. Zamora capped off last season with a win. She’ll be looking to match that again. The nineteen-year-old “SUPERGIRL” from Kennewick, Washington has had a busy racing schedule. Zamora has run a full season at Evergreen Speedway earning the Rookie of the Year title. In addition, Zamora placed 5th overall in the Speedway Chevrolet standings, 4th in the Bud Crown standings and the NASCAR Whelen All American standings. Zamora was also invited to participate in a diversity combine for Toyota Racing Development. Her great test results earned her a 3-ride deal with High Point Racing. Getting used a different car, crew and racing venues, Zamora has had great finishes. The biggest battle will be for the 2018 runner-up honors. A two-point battle between second and fourth will keep everyone on their toes. Andy Sole (San Tan, AZ) has had consistent finishes all season and looking to improve his season high 4th place. He sits on top of the point heap. Mitch Kleyn (Quincy, WA) is the only driver to compete in every NWSLMS touring event. Kleyn has had two runner-up seasons, as well as two third place finishes in the championship standings. He’ll be looking to improve on that in his bid to move up the standings ladder. Trenton Moriarity (Monroe, WA) has had to battle his way back into the points after missing the Montana 200. Moriarity is still looking for that elusive first touring win in his rookie touring season. Don’t count out Doni Wanat (Woodinville, WA). He’s come on strong is the latter half of the season, winning the last NWSLMS at Evergreen Speedway. He’s trails Sole by 18 points. This is just the tip of the ice burg. Just to name a few: Garrett & Jan Evan’s father/son team is back after a few races off. Add to that Gary Lewis, who’s been missed for a couple years is back in action. Lots of racing action expect. The NWSLMS is part of the Fall Shin-Dig weekend. The racing action gets underway Saturday at Wenatchee Valley Super Oval. For additional information, please contact Jarrod Goodwin (509) 879-5082. In their fifth season, the Northwest Super Late Model Series Inc. is the premier regional touring Super Late Model series in the Pacific Northwest. The series has many valued marketing partners including Hoosier Racing Tire, McGunegill Engine Performance, AR Bodies, Accelerated Graphics, Five Star Bodies, Longacre Racing Products, Franks Racing Radio, Jefferson Pitts Racing, Bassett Wheels, TI Company, Pacific Steel Structures, LLC, Leonard Evans Used Car Super Store and Racing Dynamiks. 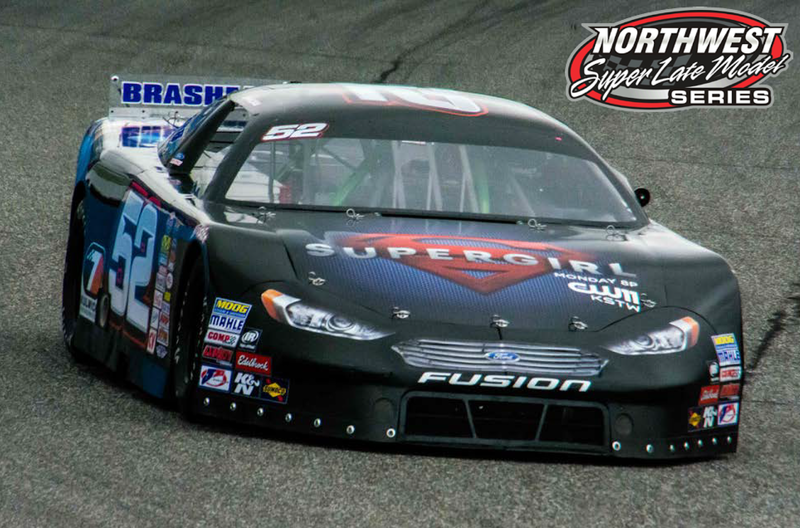 For more information on the series visit www.nwsuperlatemodels.com or on Social Media, Facebook (NWSLMS) or Twitter (@nw_latemodels).